The winner of the 2014 Green Cleaning Award for Schools & Universities Honorable Mention: New Program, CCSD employs a strategic plan that treats cleaning for health as a fundamental component of education. They are making decisions based on student and staff health and getting buy-in from teachers, nurses, students and administrators in the process. When it comes to volatile organic compounds (VOCs), CCSD is adamant about elimination. “There is a lot of increased respiratory illness among custodial staff, and we wanted to take out any spray that could trigger or worsen that,” recalls Thomas. Not to mention the children. “We have information that proves that products with VOCs trigger asthma,” says Thomas. Eliminating VOC-heavy aerosols and deodorizers from the cleaning program was a simple matter of finding Greens Seal-certified replacements that don’t contain VOCs. Getting the teachers to keep Lysol out of the classrooms was a bit trickier. Thomas refused to purchase Lysol for teachers and other staff members, while providing them with literature from Healthy Schools Campaign and the EPA on the dangers of products with VOCs. 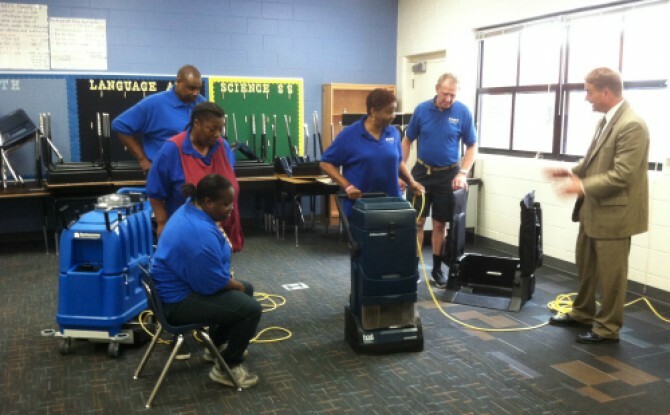 To help teachers who were used to wiping down surfaces with brands they’d been trusting for decades, Thomas offered to fill empty spray bottles with her Green Seal-certified, district-approved cleaners. She also made sure to provide teachers with its MSDS. Teachers eventually came around and started changing the supply lists they sent home to parents to include empty spray bottles and microfiber cloths rather than expensive containers of cleaning wipes and smaller bottles of hand sanitizer. “Maybe it’s better for those families to send in school supplies that their children can use for their education rather than to clean,” wonders Thomas.